Reviews: Audient ASP8024 Heritage Edition, Propellerhead Reason 9, Bose F1, Boss RC‑202 Loop Station, Akai MPC TouchApogee Symphony I/O MkII. Features: Recording Drums: What Difference Does The Room Make? (Cover), Jack Garratt: Producing Phase. LANDR, CloudBounce & The Future Of Mastering, Inside Track: Tim Latham & Derik Lee. Techniques: Mix Rescue, Session Notes. B5 utilises clever synthesis tricks to overcome the ‘sample stacking’ phase-cancellation artifacts typically associated with sample-based virtual organs. The MPC has always been about its fast, hands-on interface — can a touchscreen make it even better? Apogee’s Symphony interface has been Thunderbolted, touchscreened and released back into the world as the Symphony MkII. With the unusual ability to ‘steer’ its drivers to achieve optimum dispersion, Bose’s latest portable PA system is both powerful and versatile. Boss’s latest desktop looper might be small, but it’s no lightweight in terms of features. Plucked from the Dreadbox collection of modules, Omikron is a 22hp dual VCO, while the Lamda is a 20hp multi-mode filter. EHX have produced two versions of their Lester rotary-speaker pedal, one for keyboard players and the other specifically tailored to guitar. Foote’s latest design could be that rare thing: a mastering-grade compressor for the masses. Fostex’s new headphone range offers closed, open and ‘semi-open’ options. But what’s the difference, and which would suit you best? We took HK Audio’s new mid-priced active speakers to an outdoor festival to see if they could cut the mustard. The LEP LepLoop takes a decidedly unconventional approach to the groovebox format. Orchestral Tools go up to 11 with a large-scale symphonic library inspired by a sci-fi masterpiece. Pedalpunk offers a well thought-out means of incorporating your unbalanced guitar pedals directly into a recording system, where balanced line-level signals are the norm. PreSonus’ latest speakers employ an intriguing driver configuration that makes them more versatile than traditional designs. Primacoustic’s VoxGuard and VoxGuard DT are compact acoustic screens, intended for use behind microphones. Propellerhead’s latest Reason update adds features you never knew you wanted — but which you might find indispensible. Do monitors now deserve a place alongside chocolate, watches and army knives on Switzerland’s list of exemplary exports? We think so! With the BeatBuddy Mini, getting a good-sounding rhythm accompaniment is as easy as tapping your feet. Sonokinetic’s Sotto takes a different approach to orchestral sampling. Could the Two Notes Reload be the last word in studio guitar amplification? If you are seeking material to give your next score a genuine flavour of the music from countries such as Egypt, Morocco, Tunisia, Turkey or Iran, then this library may well be a relatively inexpensive place to start. Cubase’s Channel Settings Panel lets you see what’s going on under the hood of the Mix Console. The hottest Broadway show for decades has spawned a smash hit album. But, as engineers Derik Lee and Tim Lathan explain, Hamilton is not your average ‘original cast recording’. Don’t let tempo changes cost you extra time in Logic Pro X. We round up some of the most useful Max For Live devices that can make your work with Live easier and, hopefully, more musical. Sometimes it’s better to revisit musical decisions than to persevere with a troublesome mix — even if that means recording new parts. We get to grips with Reason 9’s new Player modules. Recording Drums: What Difference Does The Room Make? One Drum Kit. Seven Rooms. 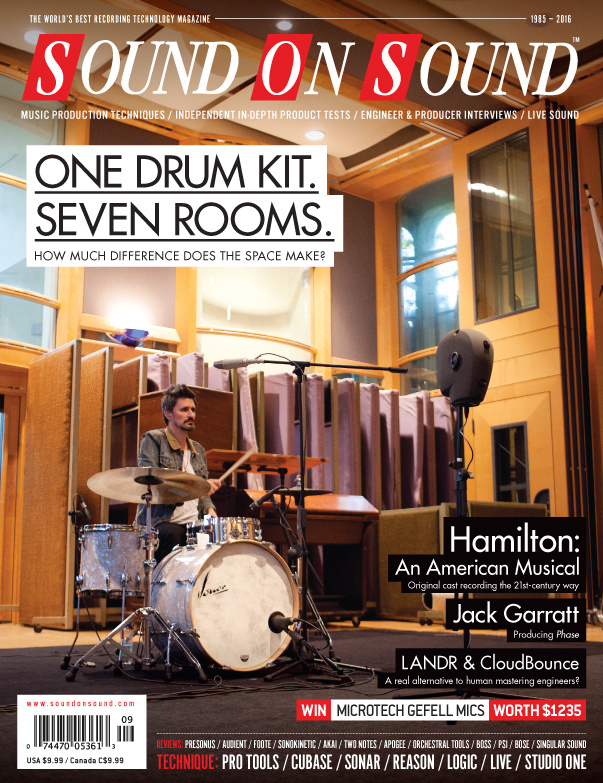 Read more about Recording Drums: What Difference Does The Room Make? Studio One’s unique Project page lets you move seamlessly between mixing and mastering. When recording drums, sometimes it’s best to go with the ‘safe’ options — but occasionally there’s time to experiment! Run your plug-ins at higher sample rates in Sonar. Frustrated by I/O limitations in Pro Tools? Here’s how it all works. Singer, songwriter and producer Jack Garratt is only 24, yet his debut album Phase still draws on a decade’s experience in the music business. Do the tools we use define the music we make? Grammy-winning producer/engineer Vance Powell welcomes SOS to Sputnik Sound in Nashville to show us how he recorded a track for rock act Tyler Bryant & The Shakedown. Q. How do I set my DAW levels to match my hardware? Read more about Q. How do I set my DAW levels to match my hardware? Q. How should I set up stereo-widening delay effects? Read more about Q. How should I set up stereo-widening delay effects? To get a job in the media you need to do a job. Specifically, you need to write a pitch that will blow the doors off. Just as music and technology have been converging, so have studios and the tech industry. Media content for the September 2016 issue.